We got to interview our favorite Australian food blogger, Alexandra Cook of It’s Not Complicated Recipes and we’re so excited for you to meet her! Alex has been a member of the Girlcrush community from the very beginning and we have absolutely loved watching her brand evolve into what it is today. Tell us about yourself and your blog! Hey all! My name is Alex and I am 32. I am a born and bred South Australian. I have a passion for all things food, wine and travel. My blog, It’s Not Complicated Recipes, was created as an outlet to express my passions. I launched it almost 8 months ago! I seek to inspire people to cook from scratch and make delicious meals – giving you lots of hacks and tips along the way to keep it simple! My motto is Crave, Cook and Consume! The name just stuck, and from that day onwards, I started making my game plan for the blog! I will be your best friend in the kitchen! Can you tell us about your ideal reader? Someone who loves to cook and eat as much as I do! I have designed the blog to suit people who are both new to the kitchen, or experienced cooks. I want it to be accessible to all. At the moment, this is definitely what I need to work on the most! I sometimes get so caught up in work, that I find myself awake at 3am! And as someone who really should cut down on her caffeine intake and thrives on balance, this isn’t ideal. My structure, when I am adhering to it, is to start the day with a small meditation and a clear mind. Some days are spent just in the kitchen, and others are spent just on the computer. Some days are even spent in my local coffee shop! I think it is important to change your environment, and as I work from home, I sometimes have to get out of my apartment! Is blogging your profession or hobby? My profession now, but writing has always been a hobby of mine. What has been your most successful blog post? 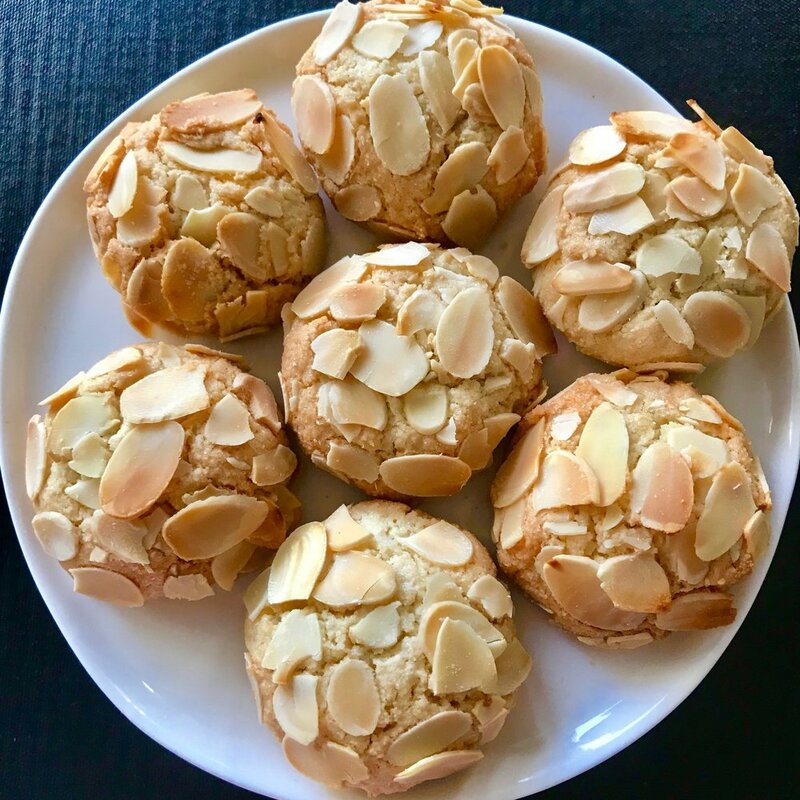 Definitely my Almond Cookies, which are Gluten and Dairy Free! They’re super easy to make, and so delicious; you would never know they don’t contain gluten or dairy! It’s also a recipe very close to my heart, as a dear friend passed it down to my Mum many years ago. Describe your writing process from start to finish. I have a working document of recipe ideas and foods to try. I firstly select the recipe I want to work on, then develop and draft it. This depends on the time of year, holidays, events, great seasonal produce and various food trends. I cook each recipe a minimum of three times, to ensure it works to perfection. I photograph each step. I then fine tune the method, notes etc. and create the recipe as a whole. Once this is done, I begin writing the blog post. I like to share a little story about the recipe, and some facts people might not know about the ingredients. I try to be informative, but not boring! One of the things I love about my job is that I can literally work anywhere! As long as I have my laptop and my headphones (and a great playlist on hand) then I am good to go. Bonus points if I have a coffee, too! What were the first few steps you took to get your blog up and running? It was a slow process to begin with! At first, I thought I could do it all myself. I quickly realised that my technological skills were not quite at the level required to build a website! I sought help, and that got me up and running! I think it is important to realise your strengths and weaknesses – I definitely could not have done this alone! What has been the most effective way of raising awareness of your blog and attracting an audience? Definitely making great connections with other bloggers – I feel that it is very much an industry where you support each other. I saw a great quote the other day which is so true “nobody supports you like a social media friend you have never met”. Surround yourself with other boss babes! I honestly thought I was someone who was good with technology – and then I started a blog! Turns out my skill set is rather basic and outdated! I feel like I learn something new every day! Online forums and videos have been a huge help in learning various tricks. In all honesty though, the best thing I ever did was outsource some things, such as the building of my website. What took a professional 24 hours to do would take me a few weeks, and even then…. who knows what I would end up with! I created a vision board shortly after starting my blog, and whenever I need a motivational boost, I refer back to it. I also keep a gratitude journal, and this is a great inspiration to me. We all lose motivation at times, but I think it is especially important to remember just how far you’ve come. My recipes are simple, but they don’t use convenience foods, such as cake mix. I love things that are made from scratch – but this doesn’t necessarily mean it takes any longer! I also want my food blog to cater to everyone, so I share recipes that are suitable for people who are gluten free, dairy free, vegan, vegetarian etc. What do you wish you knew when you started your blog? Full disclosure, I had no idea what was involved when I started the blog. I guess I wouldn’t really change that though – it has been a brilliant learning experience, and I have loved every minute. If I had to change one thing, it would definitely be that I hadn’t waited so long to do this! What blogging tools/resources could you not work without? I also love Pinterest – it is the social media platform that draws the most traffic to my website and is a constant source of inspiration. I am also grateful for amazing Facebook groups, such as Girlcrush Collective, where you know that you always have a group of women who have your back!! Who are your biggest influences? Who do you admire most? Who or what inspired you to do what you’re doing now? There are so many incredible food bloggers from all over the world who inspire me every day! My love of cooking began at a very early age, and I have my amazing Mum to thank for this! She is a huge inspiration, and I am so blessed to have her working with me on this blogging journey. Nigella Lawson, Maggie Beer, Yotam Ottolenghi, Jamie Oliver and Lorraine Pascale. What advice would you give to other bloggers? Be patient and don’t give up – it can take time to build an audience! Also, quality over quantity – it is better to post one fantastic post a week than several average ones! It is hard work – I have never worked harder in my life! I am having a blast though, and that’s what happens when you find yourself doing something that you truly LOVE. Where would you like your blog to be 1 year from now? I can’t ever see myself doing anything other than blogging. Keeping that in mind, I will be working on growing my blog to be bigger and better each week. I would also love to start working on a cook book!